I so agree Jayne – this is the year for getting rid of a lot of things, including some of the government. The government is running scared and thinks that by taking the contract away from Atos that all will be fine. Well, it won’t! Here’s a reply I wrote on http://blueannoyed.wordpress.com/2014/02/18/the-buck-stops-at-the-top-ids/ blog. Great post! 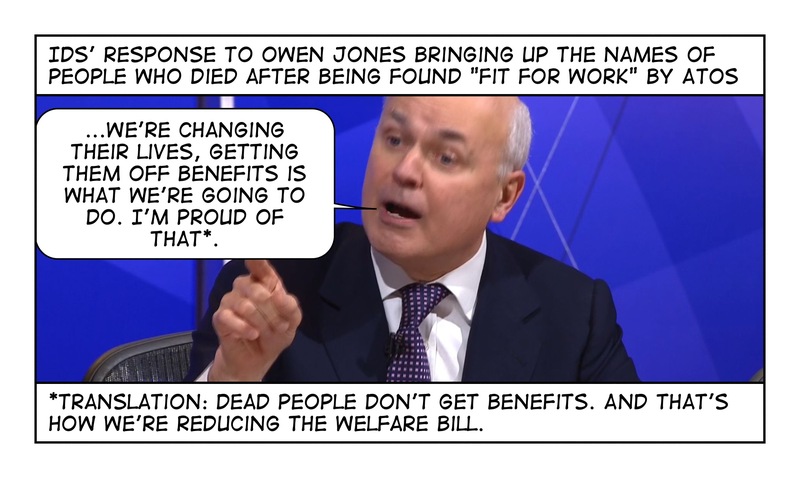 I wholeheartedly agree with you about IDS and Fraud – they should both be removed asap. However, people suspect that IDS will be sacked later this year or early next year as a shock tactic for the tories election campaign. Get rid of the one that everyone hates and blame him for everything! Not fit for work for 6 to 12 months. Unfit for work for life. Doesn’t really take much more than that really. The amount of money saved from the likes of Atos and others companies like it could then be used to fund the sick and disabled, or fund parts of the NHS including GP’s surgeries, who would probably need another clerk or secretary to concentrate on the GP’s finding and send out the relevant answers. Just a small point, relating not to WCAs but to DLA home visits – I had one, and the Atos assessor (now removed from the Medical Register!) created his own leeway – by flat-out lying about almost everything I’d said. The WCA criteria may be some of the problem – even most of it – but the fact that Atos are well known for outright lying – both leaving out relevant things and fabricating them wholesale – means that Atos are still a part – a significant part – of the problem!